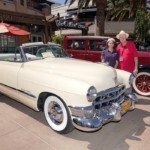 CLC Las Vegas held their annual “Cadillac Through the Years” Show on Apr 29 at Town Square. 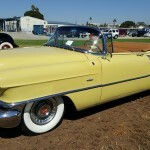 Chardonnay Knox (Lyle’s daughter) is posing with her 1949 Series 62 Convertible. Lyle’s 1941 Cadillac Limo won Best of Show. And no, that is not Lyle posing with Chardonnay. 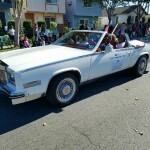 Larry Braun, Bill Foster, Fritz Wilson, & Don Feeney drove their Cadillac convertibles with 5 lovely pageant winners in the Long Beach Veteran’s Day Parade on Nov 11: Ciarra, Corryn, Kristina, Lacy, & Natalie. 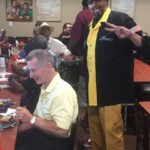 Aug 5th was our breakfast meeting at the Golden Corral so Fritz Wilson could join us. Food & service were very good, and attendance was outstanding. We had several hours of fun swapping stories and enjoying each other’s company. We will definitely do a repeat! Click more to see photos from the breakfast. 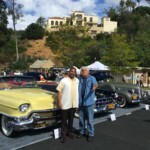 City of Beverly Hills sponsored a Concours d’Elegance May 7 at the famous Greystone Mansion of the Doheny family. 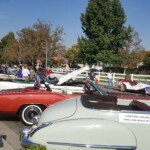 Unique Car Club was represented by Omar Prioleau with his award winning Triple Crown Best of Show 1956 Cadillac. 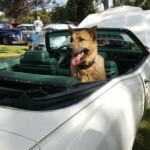 Long Beach K-9 Police partnered with Sultan Car Club for a successful car show May 13 featuring a live band and an extensive hour demo of the K-9 dog team. Our entries included Carol Park and Don Feeney. Mike Terry donated his beautiful garage for our meeting on May 3, and also provided a delicious BBQ dinner cooked on site. Thank you Mike, for your gracious generosity. Click More for more pictures. 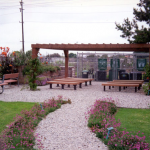 Mark your calendar for Saturday June 6 for our annual picnic at Columbia Park in Torrance. We have upgraded our assigned area to include a shelter. See light blue tables (COP15) in the map below.